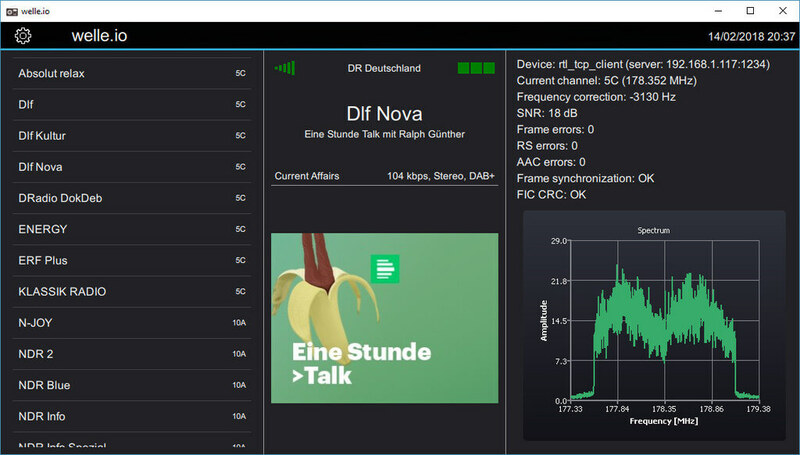 Welle.io is a Windows/Linux/MacOS/Android/Raspberry Pi compatible DAB and DAB+ broadcast radio decoder which supports RTL-SDR dongles, as well as the Airspy and any dongle supported by SoapySDR. It is a touch screen friendly piece of software which is excellent for use on tablets, phones and perhaps on vehicle radio touch screens. DAB stands for Digital Audio Broadcast and is a digital signal that is available in many countries outside of the USA. The signal contains digital broadcast radio stations, and is an alternative/replacement for standard broadcast FM. We fixed a lot of bugs again and added the translation to Hungarian, Norwegian, Italian and French. Binary packages are available for Windows, Linux and Android (APK and Play store). The macOS support is possible via Homebrew and we now that welle.io runs also on a Rapsberry Pi 2 and newer. For questions and support please feel free to use the new forum (https://forum.welle.io).